Drawing by Jacques-Louis David of the Tennis Court Oath. Wikimedia. Public domain.European modernity has been defined by the struggle of competing economic and political models, both within and between countries. The victory of an openly anti-austerity party in Greece, elected with a clear mandate to change the status quo, risks bringing home Europe’s new structural incapacity for change. The recent negotiations between Greece and the Eurogroup resulted in an agreement to extend the country’s bailout program by four months, with minimal concessions to the new social course demanded by the Greek government and no compromise on debt restructuring. Many within Syriza’s left, from Stathis Kouvelakis to Costas Lapavitsas, have seized on the uncompromising attitude of European partners to question the government’s policy of changing Europe from within, arguing that only an exit from the euro and a default on national debt can ultimately allow Greece to live up to the alternative economic course it promised voters. At the Syriza Central Committee meeting on the last week of February the Left Platform faction was narrowly defeated by 55% against 45% on these proposals. In Spain, Podemos is struggling to strike a difficult balance between demands to regain national sovereignty from “austerity Europe” and a more conciliatory rhetoric on the possibility of transforming the EU. It is no coincidence that intellectuals such as Toni Negri are joining calls for Podemos to stick to a radical-but-European course of action. Agreed, Europe will not be changed in a day. Sandro Mezzadra and Etienne Balibar do well to emphasise the necessary longue durée of a political shift in the European Union, claiming that Syiza has “won time” and that this time needs to be employed to engineer a “constituent rupture” with the current course of Europe’s history. But how long is too long for distressed citizens to continue believing in the possibility of European change? And above all: is there at least something correct in the critique that the current EU institutional set-up makes it structurally unfit for change? Germany's long-term vision seems to be that of an export-driven Europe where human capital, wage moderation and efficient institutions offset the competitive advantages of emerging countries. But there is widespread agreement that the type of brutal deleveraging policy imposed on peripheral countries is no economically sound way of getting there. A competitive economy – as Germany teaches – is based on investment in education and research, on innovative labour relations, on ecological and energy transformation, on good governance and legality. Not on impoverishment and pauperization. So why is Europe’s most successful economy insisting on the most unsuccessful economic policies for the rest? From a risk-aversion perspective, it is at least understandable that in a monetary confederation without economic or political union there is little willingness to mutualise risk with countries that still remain “semi-sovereign”. The European Council is marked by informal reform promises between nations, with a decision-making structure primarily based on mutual trust between heads of state and where the only binding mechanism comes from agreed fiscal targets and implied financial threats. It is unsurprising that deficit and debt targets have become such a fetish in the European Union. And not because of the moralistic German wordplay between “debt” and “sin” – Schuld - but because of the perception that they represent the only “constitutional” weapon in the feeble Confederation of semi-sovereign states. The statement of Yanis Varoufakis upon leaving his first Eurogroup meeting is telling of this attitude: “One of the great ironies of the Eurogroup is that there is no macroeconomic discussion. It’s all rules-based”. The new European Commission may have introduced a modicum of political discretionality through its emphasis on “flexibility”, but this amounts to little more than a game of plus or minus a few decimal percentage points in these same fiscal targets. In this much, the hard-liners of Syriza have a point: it is difficult to imagine a situation where a relative change in the balance of powers within the current institutional framework – say, following the election of a second anti-austerity party in another country –leads to any significant change in EU policies without a change in decision-making structures. The more realistic outcomes are either a very moderate adjustment or a paralysis of decision-making through a collapse of mutual trust. Without a transformation of the European Union, or at least of the Eurozone, in a democratic political union of federated states sharing fiscal, economic, and social policy, we will continue lacking any “space” where a political struggle may be fought with the possibility of substantive change in policy orientation. And at some point, the “national option” of EU exit and deft default – be it through right-wing extremism or left-wing “socialism in one country” – will begin sounding appealing to most, and with reason. As Thomas Piketty stresses in his interview with Pablo Iglesias, we need to move beyond the collective hypnosis that European treaties cannot be modified. In principle there is a peculiar alignment of interests for institutional change. It is not just in the interest of the left, or of the most indebted countries, to democratise economic decision-making and open the door to common European economic and social policies. It is equally in the interest of the most economically successful sectors, which are jeopardizing their welfare by locking-in a system of governance that perpetuates bad decision-making for most. On 20 June 1789, in France, members of the Third Estate left the Estates-Generals, renamed themselves the National Assembly, and famously swore on a tennis court “not to separate until the constitution of the kingdom is established”. 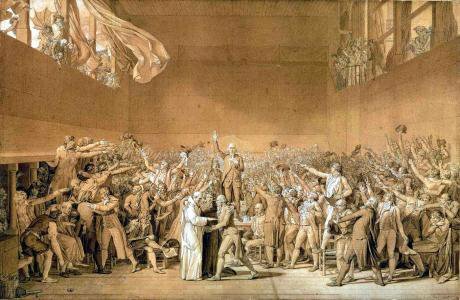 The Tennis Court Oath marked a pivotal change in the political dynamics of the French Revolution. No longer was the request for better policies, but instead for an overhaul of the very system of government of the country, seen to be unable to respond to the requests of the majority of its citizens and structurally linked to the entrenched privileges of the upper classes. Europe today needs its Tennis Court Oath. National leaders, beginning from Francois Hollande and Matteo Renzi, need to move beyond the search for minimal budget flexibility and pose strongly, from within the European council, the question of integration and the need for a grand bargain to reform the EU and the Eurozone. European parties, and the European Parliament as a body, are to be held responsible for their failure to speak up ambitiously on this point, including through non-conventional political action. Anti-status quo parties such as Podemos, Sinn Fein, or Syriza, have all to gain by developing and publicly advocating common proposals for an alternative European republic. Budding transnational radical movements, such as Blockupy, cannot rest content with attacking the austerity regime: they must become at once more radical and more propositive, demanding a constitutional reconstruction of the European space. When institutions begin to fail systemically, they are ultimately replaced or implode. It is up to our collective political agency to anticipate and guide this process. The King of France ultimately gave in to the requests of the Third Estate. But it was too late to save his kingdom or his head.